Join us for this free public event for Art By Night! In partnership with Roanoke Valley Reads and CityWorks (X)po the Taubman is proud to invite you to a Positive Action Poster Making Party. This event will combine a close look at our exhibition, In Our Own Words, with the themes of civic action and empathy explored in Sunil Yapa's The Heart is a Muscle the Size of a Fist, Roanoke Valley Reads 2018 book. Surrounded by rolling images that will explore the history of broadsides, create your own positive action poster with the materials provided. Using the exhibition for inspiration, we invite you to tell someone's story. It could be your own story, a friend or family member's or someone you meet for the first time that evening. Effecting change in the community around us requires that we understand each other. Be inspired by others. Challenge yourself to create a poster from a place of compassion, and share and talk to others over drinks and refreshments provided by Morning Brew Cafe! Galleries are open until 9pm. This event is a 2018 Roanoke Valley Reads Event, in partnership with CityWorks (x)po and a part of Art By Night. This October, Roanoke Valley Reads will promote the reading of the novel Your Heart is a Muscle the Size of a Fist by Sunil Yapa. Set during one day of the 1999 World Trade Organization (WTO) protests, the story weaves through multiple perspectives exploring the question of what we stand up for, what we defend, and how we do it. The book has been called fast-paced, enthralling, compassionate, and visceral. In a period of protests and civic action, the book is sure to start conversation. 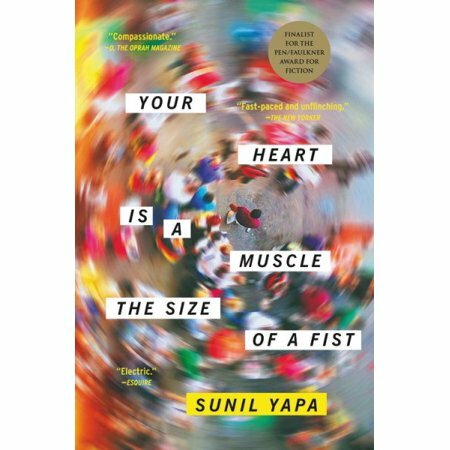 A finalist for the 2017 PEN/Faulkner award, Sunil Yapa’s debut novel Your Heart is a Muscle the Size of a Fistwas a Barnes & Noble Discover Great New Writers Pick, an Indies Next Pick, and was named one of the best books of 2016 by Amazon, Time Magazine, The Washington Post, and others. The novel was described as “fast-paced and unflinching” by The New Yorker, “a genuine tour-de-force” by The Seattle Times, and “generation-defining” by The Toronto Star.